The very important aspects "coordination" and "harmony of the pieces" can be studied well in those chess endgames and help to improve the practical play. Especially the geometry of the knight can be analysed in great detail. This avoids knight forks not only in the endgame as long as you remain in the "knight check shadow". The international acclaimed endgame expert looks at the winning motifs of the side with the rook like giving back the exchange, opening lines and restricting the knight with many well chosen examples. Of course the question of the right exchange also plays a vital role, when converting the advantage. The grandmaster from Hamburg Dr. Karsten Mueller has been playing in the top division of the Bundesliga for the Hamburg Chess Club since 1988 and in 1996 and 1997 he came in third in the German Championship. 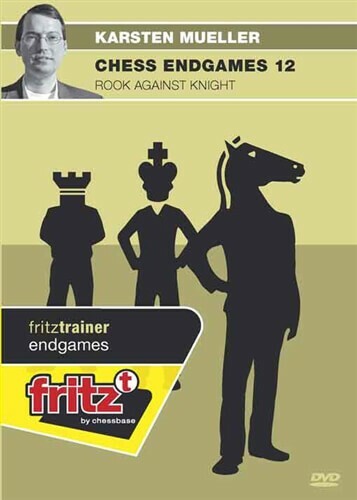 An internationally recognized expert on the endgame, he writes the Endgame Column for ChessBase Magazine and the Endgame Corner on ChessCafe.com.